Freddie Parks was born on 12 July 1941 in Madison County, Alabama. He entered the US Army on 30 October 1964 in New York. After completing Airborne School and earning his Jump Wings in 1965, Private Parks was assigned to combat duty in Vietnam. 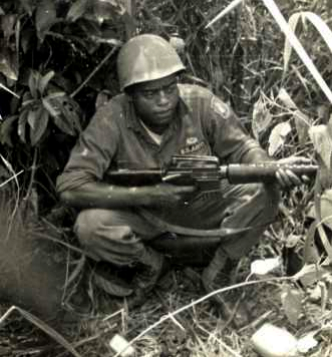 Private First Class Freddie Parks was serving with Company A, 2nd Battalion, 503rd Infantry of the 173rd Airborne Brigade (Separate) on 16 March 1966 as an ammunition bearer for the weapons platoon during a combat mission near Phouc Vinh, Republic of Vietnam. When two Viet Cong battalions launched an attack on the battalion perimeter, the main body of the insurgent force concentrated on PFC Parks' platoon and forced it to withdraw ten meters to a better position. As his squad received intense hostile fire, PFC Parks placed accurate fire on the insurgents and killed five Viet Cong near his former position. After observing a Viet Cong position to his front, PFC Parks began hurling hand grenades until a Viet Cong round tore through his helmet and knocked him to the ground. Although he was almost deafened by the concussion, he ran to the nearest group of wounded soldiers, secured their grenades, ran to the front, and continued to assault the insurgent position. He threw almost 20 hand grenades before the firing in that area stopped. After a lull in the fighting, PFC Parks volunteered for a six man patrol and began to crawl to the dead Viet Cong and retrieve weapons and equipment. On his fifth trip, he was spotted and hit five times by Viet Cong fire. Nevertheless, he single-handedly neutralized the hostile position. Although he was seriously wounded, he refused to be carried on a litter and walked to the evacuation helicopter, shouting encouragement to his comrades.For his gallantry in action on this date, PFC Parks was awarded the nation's third highest valor award, the Silver Star. He also received the Purple Heart for his multiple combat wounds. After leaving the service in 1967, Freddie Parks returned to Huntsville, Alabama.